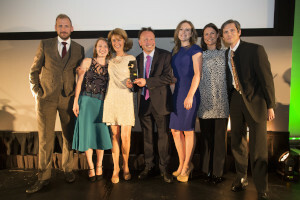 The partnership team, which joined forces in 2012, when the M&S Company Archive relocated to the University’s campus, was crowned the winner of the Employer Engagement Award at the Educate North Awards. The partnership brings together commercial insights from M&S with academic expertise from the University of Leeds to deliver a distinctive package of employer-based support for students, giving young people the necessary skills to meet industry needs when they enter the workforce. The Educate North Awards is a high profile event, which recognises best practice and excellence in the education sector. The Employer Engagement Award celebrates higher and further education institutions or teams that can demonstrate excellence in engaging with employers and creating suitable learning interventions that meet business’s workforce development needs and forge links between students and potential employers.